This product will not be shipped, you will need to collect it from the Plast Craft Games stand at Salute 2016 on Saturday 16 April. 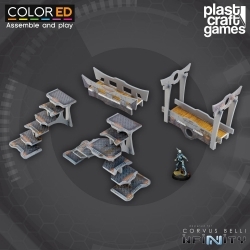 The Bridge and Stairway Set is a pre-colored scenery element designed for Infinity. It can be also used with any other futuristic aesthetic 25-28mm scale game. The Bridge and Stairway Set comes in a pack that includes a set of individual pre-colored pieces.